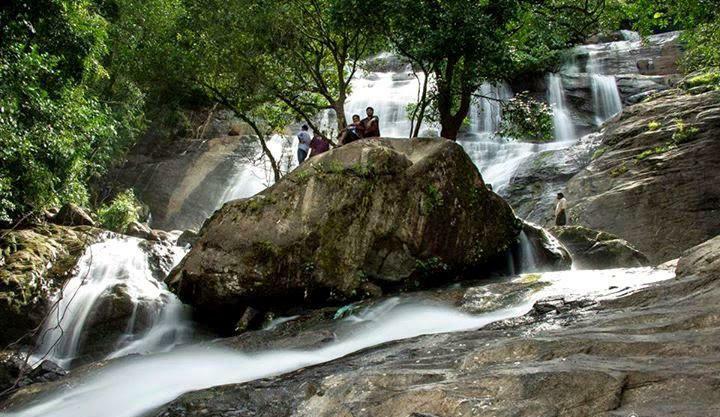 Alakapuri waterfall is located in the Kanjirakkolly in the Kannur district, which contains 3 phases. First phase is known as Elappara waterfalls; second phase is the famous one and is also known as Alakapuri waterfalls and the third phase contains the biggest water fall in the monsoon season. 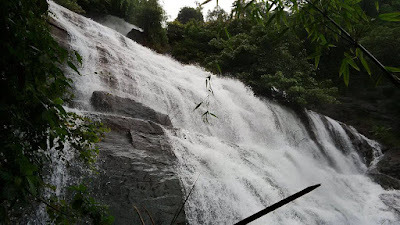 The water falls located between the foot hills of Western Ghats, bordering the Coorg area of Karnataka Evergreen Forests. The second stage of the water falls contains seven stages of shelves of rock. On the both sides of the water fall, hard Rocks look like Salamanders of the forest. The surrounding area of the falls filled with "Kurinji" and which blossomed it in every 8 years of the era. In October 2002 and then in November 2010 the plant produced blue flowers and which looks like a blue bed in that large area. The water here is starting in the area under Karnataka and then it flowing through the Kerala region.